Nifty and Bank Nifty maintains the positional sell mode with resistance zone coming around 7673 and 15569 respectively. Reverse your position to positional buy mode if the resistance breaks on the hourly charts. India VIX on the hourly charts showed a little bit of increased momentum and currently maintains the positional buy mode with the supports zone coming around 16.86 Low volatility could be observed if India VIX breaks the support zone on the hourly charts. 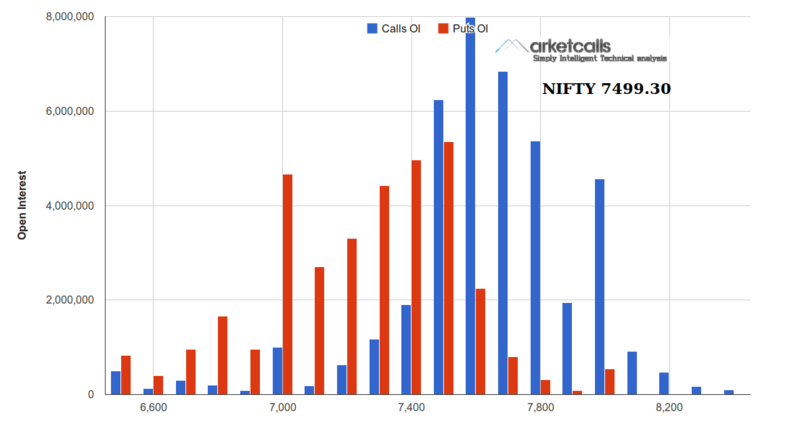 After Chasing 7700CE open interest now the option writers are interested in building huge open interest in 7600CE strike price. since 3 more days for expiry option writers now very much confident of 7600 holding as a strong resistance zone on EOD basis. Jus wanted to ask you something. I like your OI cahrt/Graph where u have clearly shown Calls/Puts Open interest in colour coding. Is there a way, where i can gather daily charts of this kind ? because , hope u mention, u have been now and then saying about CE writers increasing ……..
On june 1st week , if am not wrong..it was on june 4th i guess….u published a article, where u said 7500CE are being written heavily and u had a OI graph supporting it. So i was waiting for the expiry and to confirm how far this chart would be handy and to be frank. Even 2 days back when nifty hit 7600….i was confident…if the graph is right, the nifty should be below 7500 to make 7500CE zero… and it happened clearly the way….nifty was taken down for no reason…..and kept below 7500 classically. Anyway where can i find such cahrts on daily basis.? Where can i find old data of such graphs for backtesting ? You can get from OI tracker which updates very 5min for Nifty Options. Hi Rajandran -- PLEASE HELP ! -- When I plot super trend AFT (One above) either hourly or daily, my Buy Signal or Sell Signal including SL numbers are different from your chart shown. How come? I use data feed from GlobalDataFeed folks. Wondering how can I match up to your numbers on Amibroker so that I am up to date both on hourly as well as on EOD charts shown on your website. Please help ! Appreciate your reply. Thanks. Make sure your parameters are right and you are using non-continous contract symbol NIFTY14JULFUT instead of continous contract NIFTY-I.